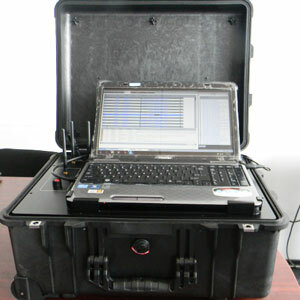 The Cellular Intercept model CC2800 is able to operate in both its Target Mode and its Random Mode. Used to investigate criminal and terrorist elements, this Cellular Intercept enables the user to direct cellular interception by variables such as the IMSI, TMSI, or cellular phone number of the suspect. In most scenarios, the user has some preceding intelligence about the suspect in question (the TARGET) under investigation. However, if there is little to no information about the suspect (for example, if the user only knows the suspect has a cell phone but does not have any information about that phone), the user may randomly monitor, listen, and record conversations until the suspect is detected. Cellular Detection: Because the signal strength of a suspect will vary at times, the system sensory function automatically observes the radio traffic while in operation. Once the CC2800 detects the variables and confirms the Target, that Target can be observed over great distances while the target travels from "cell to cell". When the Cellular Intercept performs this cellular tracking of the Targets 'hand-over' while on the move, the system's Graphic User Interface will report the hand-over data, making investigations of suspects very efficient and helpful. SMS Interception: The Cellular Intercept series also incorporates an SMS intercept, extracting all incoming outgoing SMS messaging. The output of this process will show the data interception in virtually all languages. Active vs. Passive: Because professionals know that Active Cellular Interception systems can be detected, the need for discreet monitoring is a priority. With our Passive technology, our system can capture communications without giving away any indicators to the network in its Passive Mode. This is important because not only are phone networks able to observe Active Interception techniques, but those under surveillance can also discover they are being monitored. In addition to indications from the service provider, the Target under surveillance can also use simple RF detection devices to determine if there are Active Interceptors at work in the area. You may Contact Us for documentation on our systems, read how our Cellular Intercept compares to other competitors, or visit us for a Demonstration.